This is a sponsored post, but the words, images and opinions are 100% ours. I hardly even know where to begin. This Lemon Olive Oil & Blueberry Jumbo Muffins recipe has instantly become a staple in our home. This is everything you want in a muffin. Big, fluffy, moist, crunchy-on-top, and extraordinary in taste and texture. You’ve heard us say this before, but a good recipe is only as good as the ingredients that go into it. When you go with quality ingredients, you’ll produce a better dish. It’s that simple. 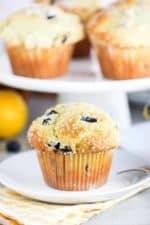 I find that muffins rise better, taste better and feel better with each bite when I use olive oil as opposed to butter. Bonus: It’s better for you, too. And when we discovered Rancho Azul y Oro, an olive oil farm in San Miguel, California who produces some of the best, homegrown olive oil on the planet, including an Estate Lemon-Infused Olive Oil, I knew I had to develop a muffin recipe that let this glorious lemon olive oil shine and was as good as any New York City bakery version. That’s a tall task. But again, starting with the best ingredients is a very good place to start. In fact, this family-run business just won the Gold Label ‘Best in Class’ at the California State Fair. That’s just one of 35 awards they have compiled in a matter of a few years. 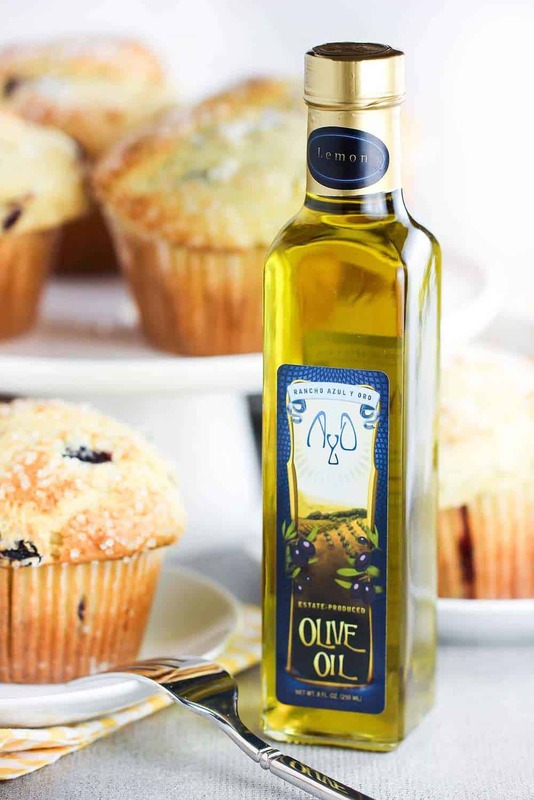 When it comes to global distribution, they are not the largest in the world of olive oil. But that’s okay, because they are about as good it gets when it comes to superior quality. 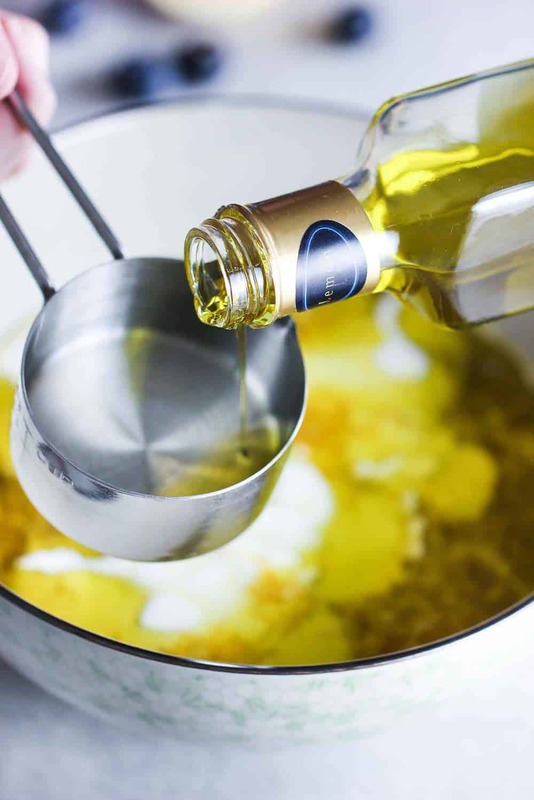 You can literally taste the freshness of the olive oil and you instantly know this is the good stuff. Learn even more about Rancho Azul y Oro by clicking here. Now, we just love those extra-large muffins you find in bakeries across the planet, and especially in NYC delis. But there is a trick to getting them to rise and make those mushroom cap-shaped tops that are so crunchy and yummy, but also stay moist and fluffy on the inside. Follow this recipe to the ‘T’…and you’ll have the best jumbo muffin you’ve ever eaten, let alone made yourself! It all starts with a wonderful batter. You’ll need extra leavener (baking soda) to get the height for the jumbo muffins. It’s critical to start the uncooked muffins off in extra hot oven (425°F) for 6 minutes, and then reduce the heat to 375° for the remainder of the bake time. This gives the muffins a rapid rise right at first, which is really important. You can easily order jumbo muffin pans and jumbo muffin liners here (Just click on the links…you can get them delivered super fast!). These muffins smell amazing when they are baking and when they come out of the oven! Make sure to use a wooden spoon to combine the ingredients, not a mixer! Over mixing will cause the muffins to be too dense, and not rise nice and tall! Oh, now that’s a muffin you’ll want to make, and eat, and make, and eat, and make and eat, over and over, again and again. And when you use the award-winning Rancho Azul y Oro’s Lemon-Infused Olive Oil you’ll get the best results you can possibly imagine. They have such an amazing array of of products to offer. 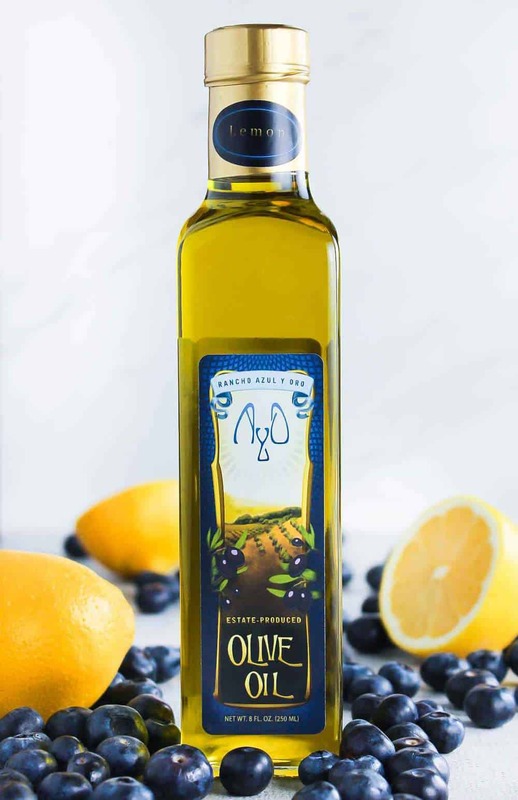 Of course best-in-class extra-virign olive oils, but also gourmet salts, spices, jams/preserves and wine! 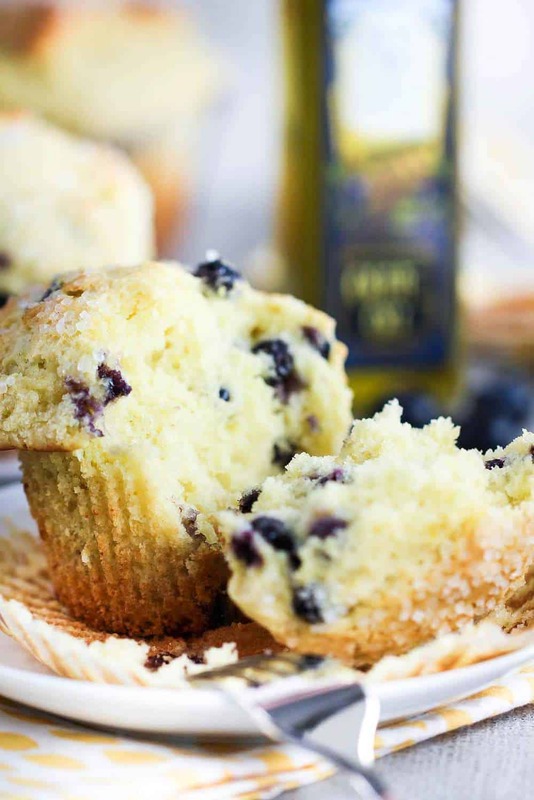 Now, it’s time to make this incredible Lemon Olive Oil and Blueberry Jumbo Muffins recipe! This is a sponsored post, but 100% of the text, images and options are ours. 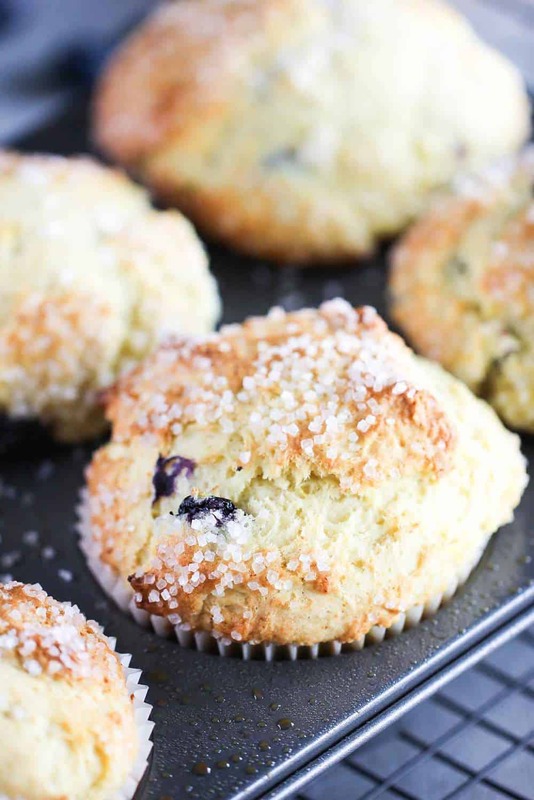 This Lemon Olive Oil and Blueberry Jumbo Muffins recipe is about as good as they come. Lots and lots of testing and research went into this ensure you get the perfectly risen, crunchy-on-top, moist-inside, and incredibly yummy muffin. Make sure to follow the recipe to the 'T' and you'll get fantastic results! In a large bowl, whisk together the flour, baking powder and salt until blended (about 30 seconds of gently blending with a whisk or fork). In a separate medium bowl, using a fork or wooden spoon, mix the eggs with the sugar. Stir until blended. Now add the oil, lemon zest, ricotta cheese, buttermilk and vanilla and mix until incorporated. 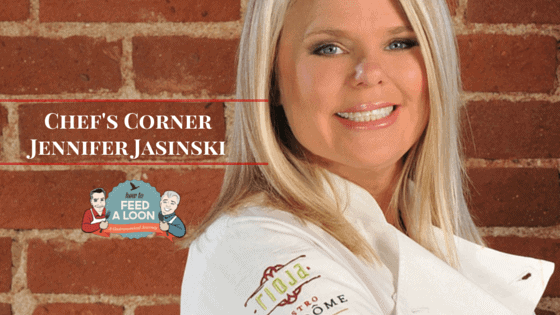 Using your hands, or a large wooden spoon, form a well in the center of the flour mixture. 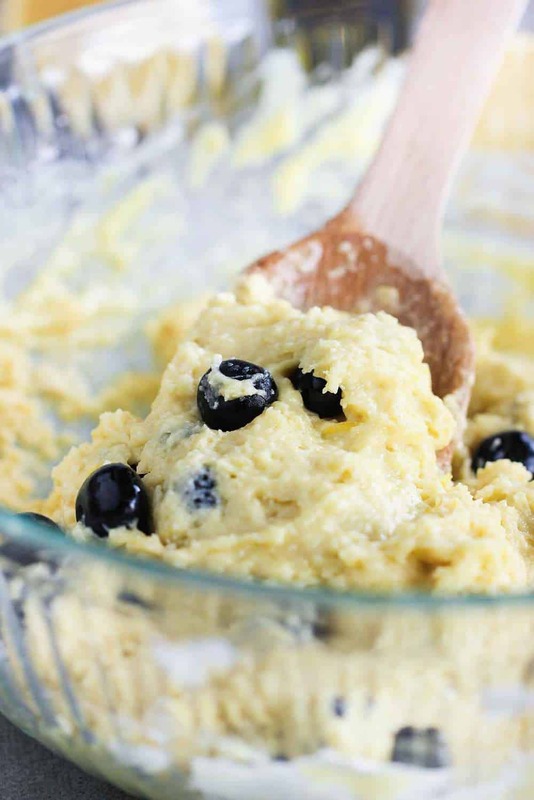 Add the egg/oil mixture and the blueberries into the well area you created in the flour mixture. Using the wooden spoon, fold the dry ingredients into the wet, slowly, until all pockets of flour have been incorporated. About 2 - 3 minutes. The batter will be very thick and resemble moist cookie dough. Spray a large muffin pan with cooking/baking spray, including the top of the pan. Use an ice cream scooper to fill each muffin holder nearly to the brim for each. Top each muffin with a healthy pinch of sugar crystals. 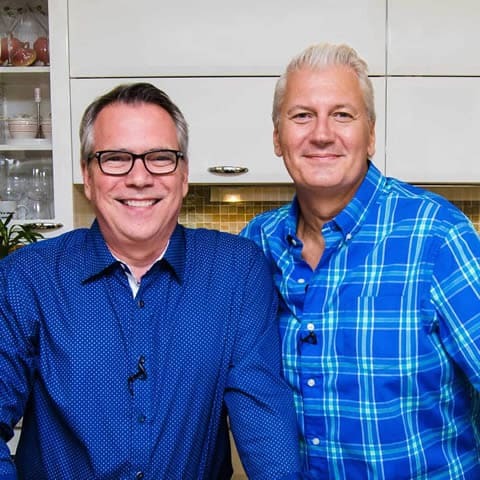 Bake for 6 minutes and then reduce oven temperature to 375°F and continue baking for 22 - 25 minutes, or until tops are lightly brown, and an inserted toothpick comes out clean. Carefully remove muffins from the tin as soon as possible. If left in the pans, the bottoms will become soggy. Let cool for at least 10 minutes on a rack. you forgot to put in the blueberries. I can’t find anything in the recipe about the blueberries. How much, and when to add them. Hi Guys, I’ve been a proofreader for many years. I catch those things. Glad I could help. I will be making them and will let you know how they turn out.